Today, Florida spends large amounts of money and resources each year to protect and preserve our wild wetland habitat. One of our most prominent plant invaders, however, was originally introduced to Florida in a deliberate attempt to destroy swamp habitat. The Melaleuca Tree is a member of the myrtle family, Latin name Myrtacea. There are about 200 species in the Melaleuca genus, found mostly in Australia but also extending into Malaysia and some of the Solomon Islands. In its native Australia, the Melaleuca grows along waterways and marshes. It produces an immense quantity of fruits and seeds, which make it a valuable food source for birds and fruit-eating bats. It is often intentionally planted as a nectar source for beehives, and is also widely used as an ornamental tree or windbreak. Because Melaleuca uses large quantities of water, it is not commonly found in the large dry Outback areas. In some parts of Australia the tree is being threatened by loss of its habitat through development, and conservation measures are being taken to protect it. In the early 1900s, sugar and citrus growers in Florida were searching for an effective way to drain the state’s marshes and wetlands to produce new farmland. One idea was to plant lots of Melaleuca trees, which would then take up large amounts of water through their roots and respire it away through their leaves, helping to dry up the swamps. By 1910 the Australian trees were a common sight in South Florida. In the 1930’s Melaleuca seeds were intentionally dropped into the Everglades by airplane, in an attempt to dry out and reclaim the “useless swamp”. Since they grew so rapidly, they were also planted in parks and backyards as ornamentals, along canals and ponds as support props for banks, and some were commercially grown for their wood. It turned out to be a disaster. With no natural checks on their growth, the trees exploded, quickly invading nearly the whole of south Florida. The oils in the tree’s leaves and bark make them flammable, which turned out to be an advantage: when the Melaleucas were ignited by Florida’s yearly lightning-strike grassfires, it triggered them to immediately drop their large number of seeds. This allowed the trees to beat the native plants to the freshly-cleared ground, and their rapid growth rate–as much as 6 feet a year–then enabled the Melaleucas to dominate and form extensive stands of monoculture. Experiments have shown that a one square mile area can be 95% dominated by Melaleuca in just 25 years. Today, Melaleuca covers an estimated half-million acres of area, particularly in the endangered Everglades habitat. Fortunately, as a tropical tree, the potential range for the plant is limited. Although the adult trees can tolerate a degree of freezing, the young seedlings cannot. As a result, the invader is only rarely found north of Tampa Bay, and is mostly concentrated in the six frost-free counties near Miami and the Keys. Melaleuca can, however, tolerate brackish water and often invades mangrove swamps. The damage has been extensive. The Melaleucas crowd out and displace native trees, and by dominating fire-cleared areas, they prevent the normal process of succession. Although the trees produce large quantities of seed and fruit, most native Florida birds and mammals don’t eat them (though honeybees seem to like the flowers as a nectar source). And, as originally intended, the Melaleucas remove large amounts of water, reducing critically-endangered wetlands habitat. The tree is listed as one of the 100 Most Invasive Species, and is considered a serious danger to Florida’s native species. Efforts to eradicate the invader have so far not been very successful. If the tree is cut or damaged, it induces a mass seedfall, which leads to more trees later. Melaleuca is also not susceptible to most herbicides. 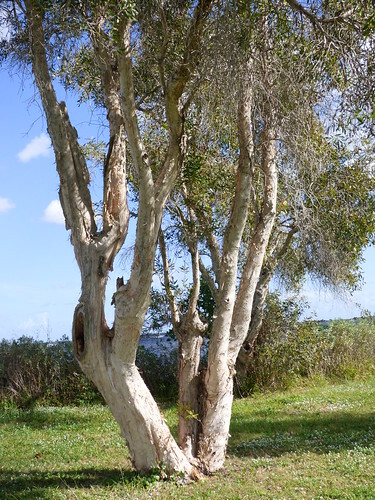 Because the wood is rot-resistant as well as fungus and termite repellant, the state of Florida has been encouraging the commercial harvesting and grinding of Melaleuca stands as a source of landscaping mulch and wood chips (and as a means of destroying the trees). In 1995, Florida also began releasing an imported Australian weevil (Oxyops vitiosa), which attacks the tree’s seeds, as a method of biological control. But so far these control methods have not been very effective. Being a Miami native, this was a great post. I took eco of s.fla and this was the highlight of the course. Sadly, Florida has all sorts of things living here that are not supposed to be. It is effecting the Everglades!